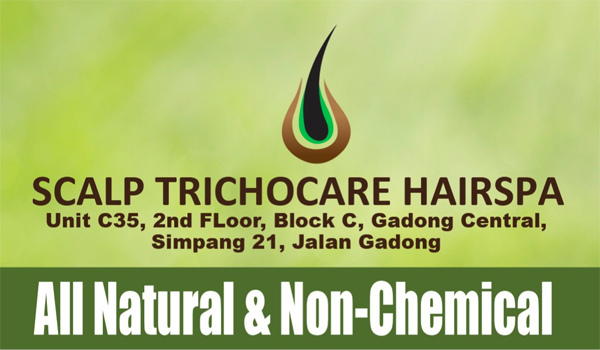 Scalp TRICHOCARE Hairspa believes that nature is humanity’s most precious asset and our herbal & chemical-free range represents their effort towards sustainable development. Most crucially, it is good for humanity’s scalp and hair. Scalp TrichoCare Hairspa is here to fulfil everyone’s hair care needs and preventing all types of hair loss issues. Our day to day exposure to all sorts of harmful chemicals and pollution affects the health of our scalp, hence, hindering and compromising its ability to spur new growth or to keep those that remains. At times, the best solution does not solely come from how advance the technology or therapy is, but it’s about the substance and amount of care (and detail) put into performing every step of the therapy. I had an awesome hairspa experience at your centre and was impressed by the service offered. My mother who was experiencing hairloss and greying hair issues were greatly taken care of by “System B”, although the name is simple, but the TCM herbal formulation is wonderful as she now no longer go for chemical monthly hair dye but go monthly to your centre – hairloss & hairgrowth & grey hair issues taken care of in 1 session. May I just add that she has more hair now and the whole head of hair is darker than prior. I am delighted that we have found a natural hair centre here in our homegrown BRUNEI DARUSSALAM. I personally love your “System A” with the acupressure point for scalp and the hairspa session. My colleagues were commenting on how healthy & lustrous my hair is. Thank you to the Chinese manager for your free consultation.